This is a review of the HP Chromebook 14 with 4GB of RAM and T-Mobile mobile connectivity, which retails for $349. The Chrome OS is sleek and easy to use, with features and functions that remind me of my favorite aspects OS X and Windows. The HP Chromebook 14 feels sturdy and, unlike other low-cost devices, like it's made of high-quality materials. 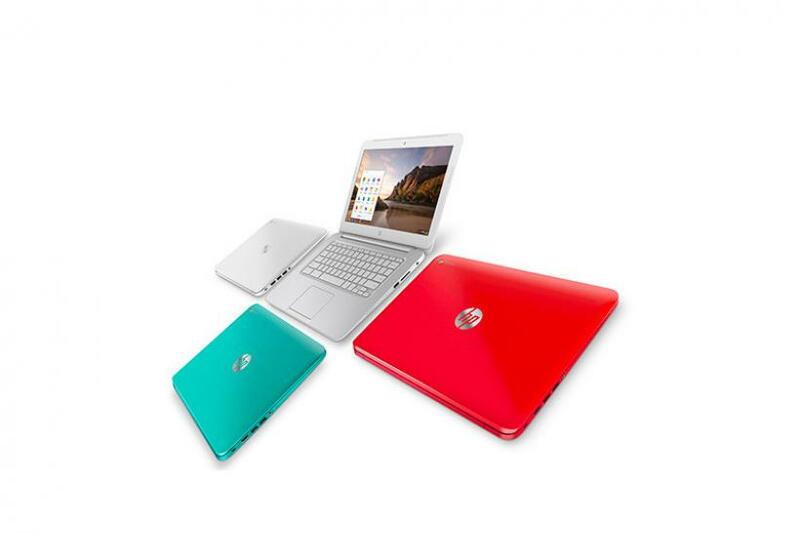 However, certain aspects of the HP Chromebook 14 betray its relatively low price point -- namely, the resolution (1366 x 768), display and limited color variety ("snow" white, "ocean" turquoise and "beach coral"). In regards to color -- why not offer the HP Chromebook 14 in black? Simple, dark and businesslike, a black model would limit the visibility of scuffs and discolorations. It's also frustrating that the laptop has little support for many popular video file formats, which is more of a limitation of the Chrome OS than the HP Chromebook 14 itself. While I do not expect Google to implement the Chrome OS with native support for all types of media files, it would be nice if some third-party software designer stepped up to do it themselves. Herein lies the issue that Microsoft attempts to make a big fuss over: since the Chrome OS is new, it lacks support for a lot of the software found on a traditional OS. More and more apps are being added to the Chrome Web Store every day, but many are missing. However, the number of apps or services that I want to use on the Chromebook but cannot is small, and shrinking. The rubberized soft-touch coating found on Nexus devices, which HP also uses for the Chromebook 14, gives it a slightly more premium feel than Chromebooks made by other companies. 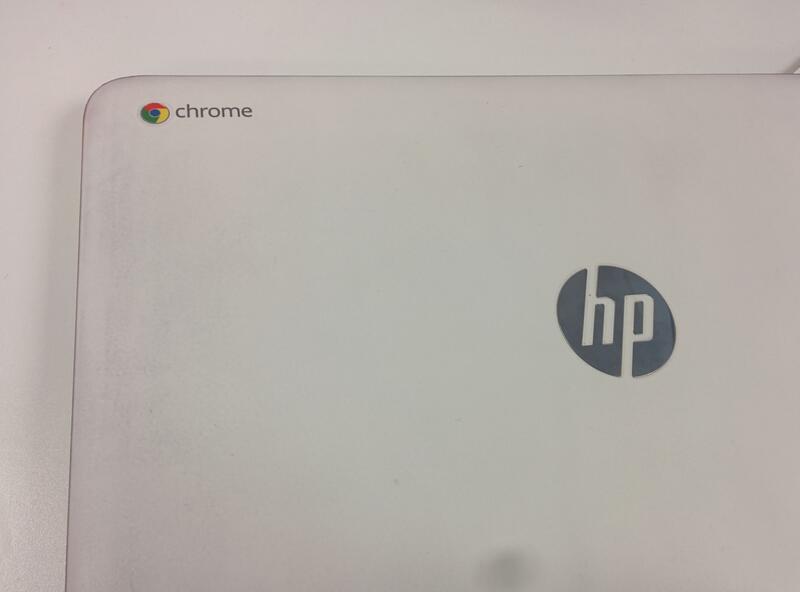 Unfortunately, that same rubber coating makes the Chromebook 14 a dirt and fingerprint magnet, and HP’s bright color selection means that any smudges are going to stick out like a sore thumb. 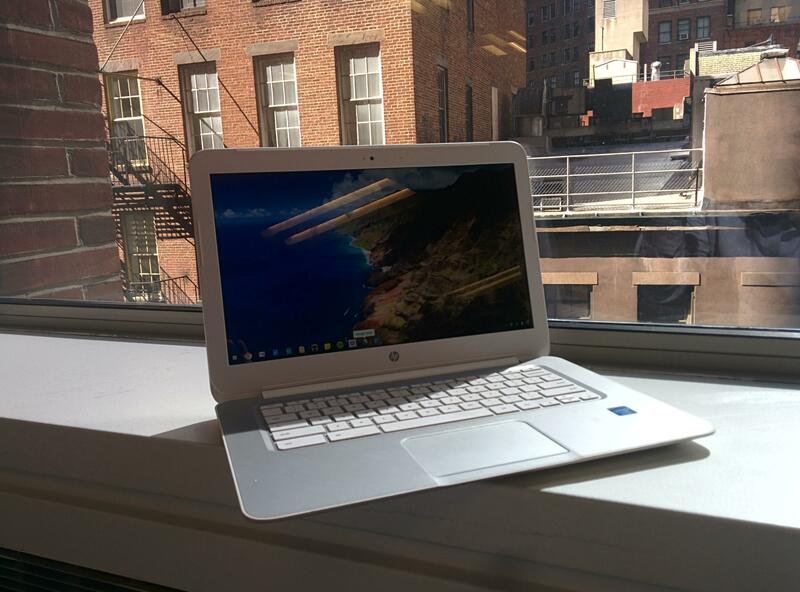 How The HP Chromebook 14 Vs. Samsung's Chromebook 2? All things being equal, I would still choose the HP Crhomebook over any other Chromebook on the market, including the yet-to-be-released Samsung Chromebook 2 or the Toshiba model. It has the largest screen, if not the highest resolution of any Chromebook yet released, and gives users the amazing ability to get things done with astounding battery life, thanks to its Intel Haswell processor. While the Toshiba packs the same processor, its smaller form factor (13.3 inches) means a smaller battery and less life away from the socket. While the Exynos processor found in the Samsung Chromebook 2 will offer quicker speed than the HP model, it's tough to imagine how much of an advantage that this would offer the user. When I worked on the HP Chromebook 14, I often had more than 30 open tabs at a time. While that might appear excessive for some, it's the norm for me -- and it wasn't too much for the laptop to handle. The HP Chromebook 14 was able to execute all of the open tabs flawlessly, including a document (Google Doc) and a spreadsheet (Google Sheets). The machine is fast: There's no lag when switching from one Google app to another, or when switching from a single website to 20 websites. With a 14-inch screen to work with, I can easily place a document on the right side using the Google OS’s snap feature, while keeping a few other apps and Web pages on the right, as I am doing now while writing this review. The only time I saw lag was when I was using the $299 model with 2GB of RAM and I had more than one or two tabs with an active video player open, like YouTube or Netflix. After upgrading to 4GB of RAM in the $349 model, I don't see the need to ever restart. As a matter of fact, the only time I power down the HP Chromebook 14 is when I notice it has an update available that requires a restart. I urge anyone considering buying the HP Chromebook 14 to go for the more expensive model. It's worth it for the extra RAM alone, but it also comes with a SIM card and free HSPA+ data from T-Mobile. I found the data to be useless in the three months or so since I purchased the HP Chromebook 14 -- since tethering it to my Nexus 5 via wi-fi gives it access to 4G-LTE speeds. However, the performance upgrade seen by doubling the RAM is priceless, especially if you multitask or leave a lot of tabs open. Yes, the Exynos processor in the Samsung Chromebook 2 is going to be more powerful than the Celeron 2655U (Haswell) from Intel, but that power comes at the expense of battery life. One of my favorite aspects of the HP Chromebook 14 is that I have to charge it less often than I do my smartphone. I use it less than my smartphone, sure, but the HP Chromebook 14 can last for days without needing a charge. And I use it daily, as do other members of my family. When I hand it to people, most notice the dark marks on the lid that come from sliding the laptop into and out of my backpack. To repeat: I really wish they made the HP Chromebook 14 in black. Some users have said the Chromebook 14 is “heavy.” But compared to my mid-2011 15-inch MacBook Pro, the thing feels like a Kindle. According to HP, it weighs 4.07 pounds. I take issue with Google’s promise of “instant updates” for the Chrome OS. I had the HP Chromebook 14 for at least a couple of weeks before it restarted automatically with the newest version of the OS one day. I know this because all of my desktop versions of the Chrome browser -- on Mac and PC -- had been updated to change the location of where to find “Recent Tabs” in the browser. Instead of being located in the bottom right-hand corner of the screen when you open a new tab, recently closed tabs are now located in the menu bar at the top-right of the screen. It took my Chromebook a couple of weeks to get there, but perhaps I should restart it more. There are really only two things I do not like about using a Chromebook as my main device -- its inability to play back locally stored video files, and the lack of gaming support. To be honest, the last one was kind of a stretch -- if I am gaming, I am usually doing it at home on a console or PC. If I want to game on the go, I grab my Nexus 5 -- an Android smartphone that’s fully capable of playing all the latest games, including my favorites -- “Clash of Clans” and “Badland” -- instead of the HP Chromebook 14. That said, there are plenty of simple games available in the Chrome Store. The type of media I consume mainly on my phone is music. I did not find myself plugging headphones into the HP Chromebook 14 very often. This is because I often am listening to Spotify on the train to or from work, where I am often underground and not able to get service. You can use the in-browser version of Spotify on a Chromebook, but on the premium mobile version, you can download playlists at a higher bitrate and play them back even when you’re not online. The 1366 x 768 resolution of the HP Chromebook 14's screen is the same as many other models, with the exception of the Samsung Chromebook 2. It's not terrible, and for work apps like Google Docs or Sheets, I notice no issues. However, streaming Netflix in HD is doable, but not all that pretty. I watched “Skyfall” that way, and while the audio was fine on headphones, the picture looked grainy. To make sure it was not due to a bad connection, I tested it on my house Internet (Verizon FiOS) connection, at a time of day when few people are online -- Tuesday, 3 p.m., to be precise, as well as over my LTE mobile connection (T-Mobile). Whereas HD videos on YouTube looked fine, Netflix appeared to have trouble. Whether this is caused by the screen resolution or Netflix’s servers is hard to say, but the results were unimpressive. I was excited to run Linux on the HP Chromebook 14, since it offered the promise of a full-fledged desktop OS on a sub-$400 laptop; one that makes use of the Chromebook’s limited resources. I found most versions to be clunky, and when I installed Videolan.org’s VLC Media Player, I realized that the audio drivers did not allow many video files to play with audio -- the same problem I had in the Chrome OS -- and promptly gave up running Linux on the Chrome OS. 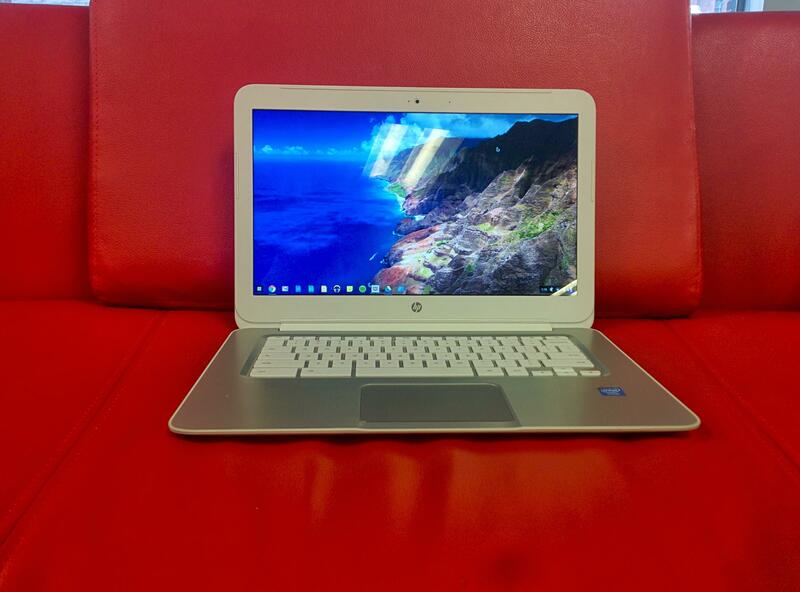 The HP Chromebook 14 has a 1.4GHz, dual-core, Intel Celeron 2955U processor. It is more than fast enough, and it's super-efficient with battery power. The $299 model comes with 2GB of DDR3/1600 RAM, and the $349 model comes doubles the RAM and offers 200MB of "free" HSPA+ service from T-Mobile. The sub-4G service is not the reason I am recommending the HP Chromebook 14 to friends and family; I'm recommending it for it's battery life, painless price point, and general ease of use.